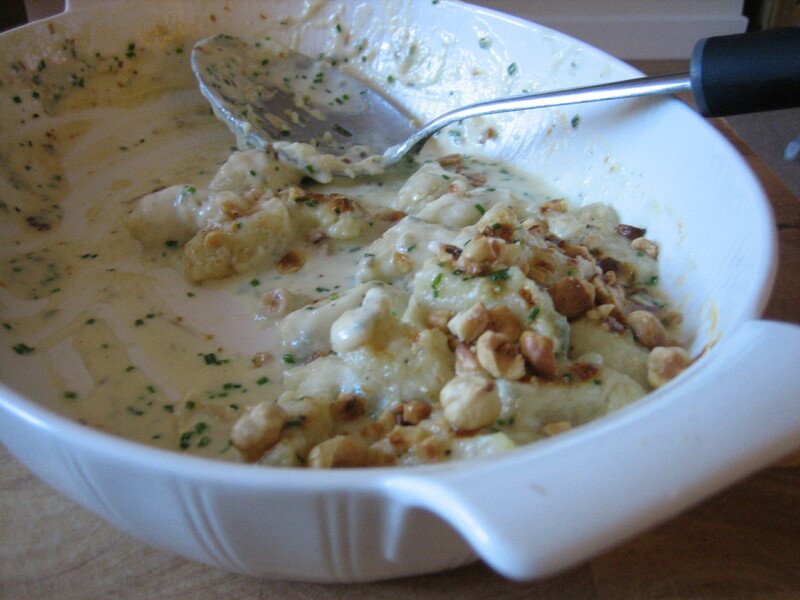 My sister is a huge fan of anything creamy, cheesy or creamy and cheesy so when I suggested “Gnocchi with a creamy Gorgonzola Sauce” as an option for dinner I knew before I asked what the answer would be. Normally I shy away from such creamy cheesy decadence however there was a tub of Mascarpone in the fridge left over from making Tiramisu and a wedge of Gorgonzola – realistically the choice was already made…. 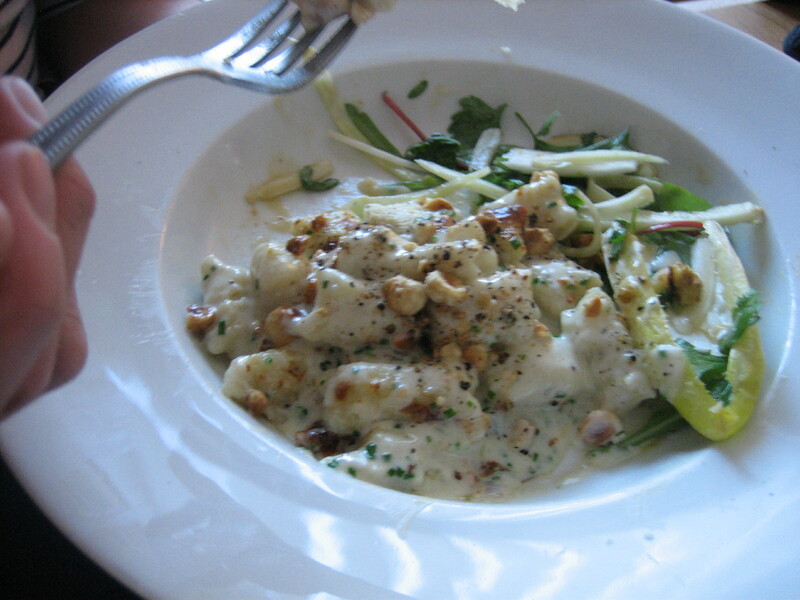 Now the thought of making homemade gnocchi I know is making you feel a little panicky already but I promise you you do not need to be a budding Gordon Ramsey to be able to pull this dish off and wow your friends. 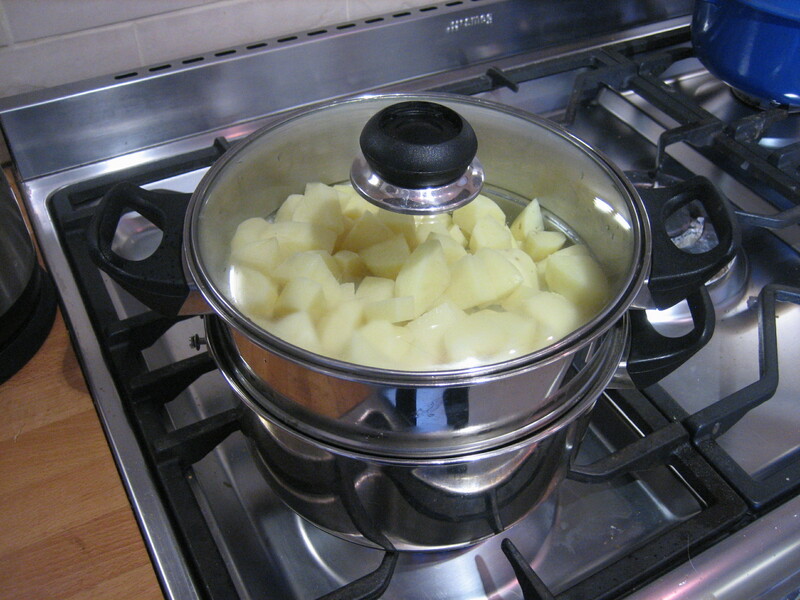 First off peel and chop the potatoes into 2 cm cubes, steam until cooked which should take about 10 – 15 mins depending on how good your steamer is. Mine took about half an hour because it was not the more effective of steamers. Annoying! 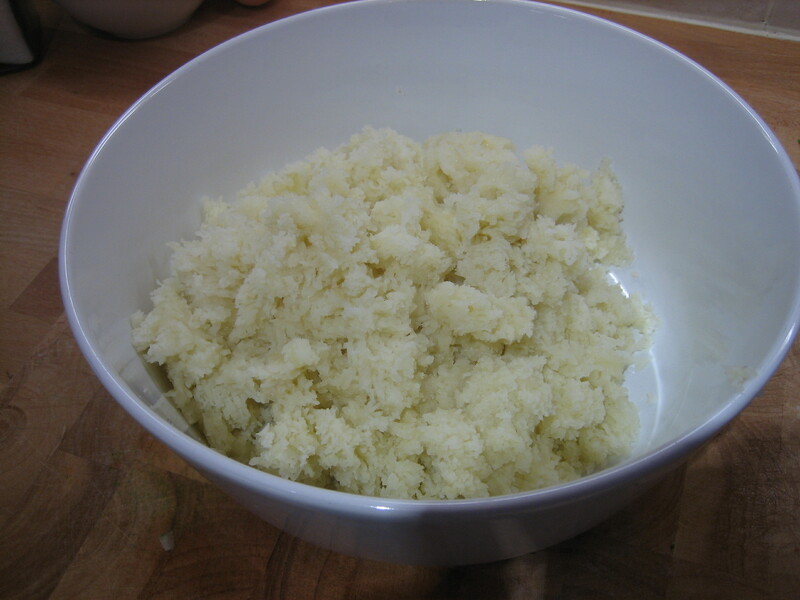 Once the potatoes are cooked pass them through a fine sieve into a large mixing bowl, you can use a potato ricer if you have one. 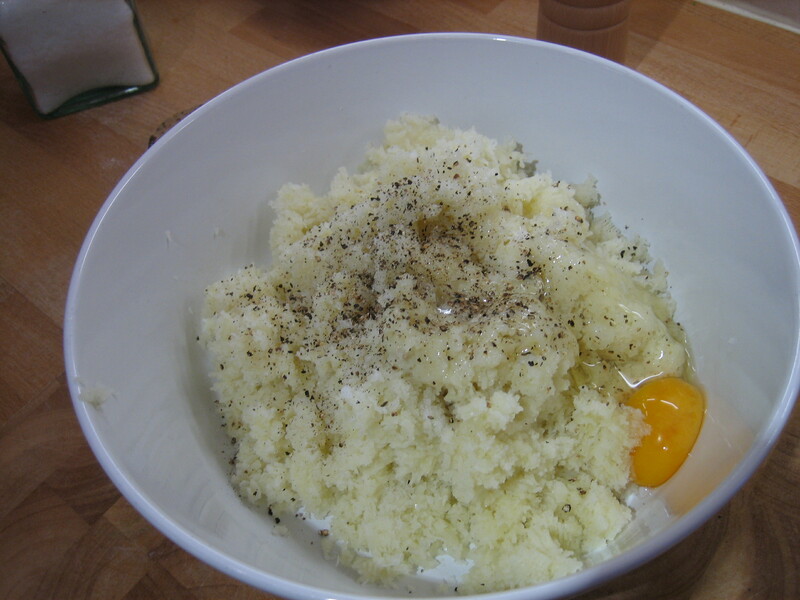 Add the egg, a large pinch of salt and several grinds of the pepper mill, add the flour in and mix into a soft dough. Turn out onto a clean and lightly floured surface. Split dough into 4 portions. Take one of your potions and roll into a long thin sausage shape – approx 1 1/2 wide. 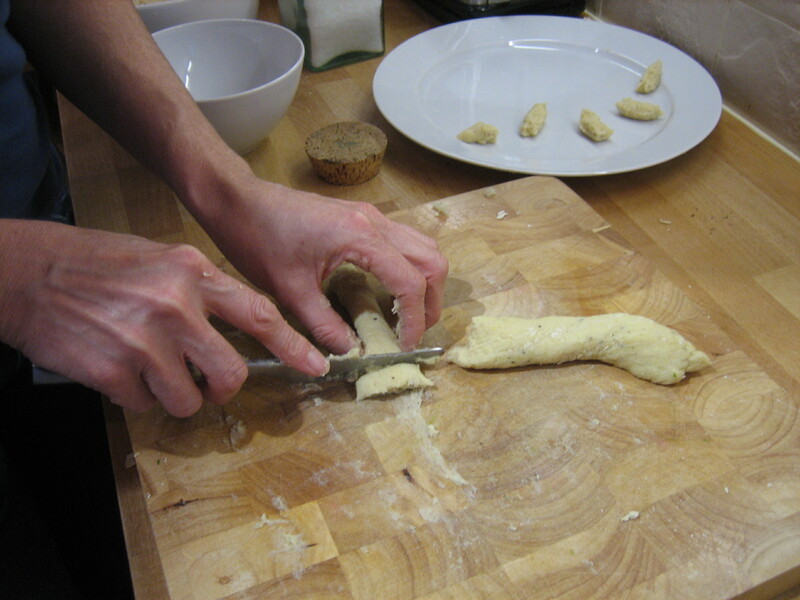 Take a butter knife and cut the sausage into small pieces approx 2 cm long and place on a lightly floured plate or tray. Do this with the rest of the dough. 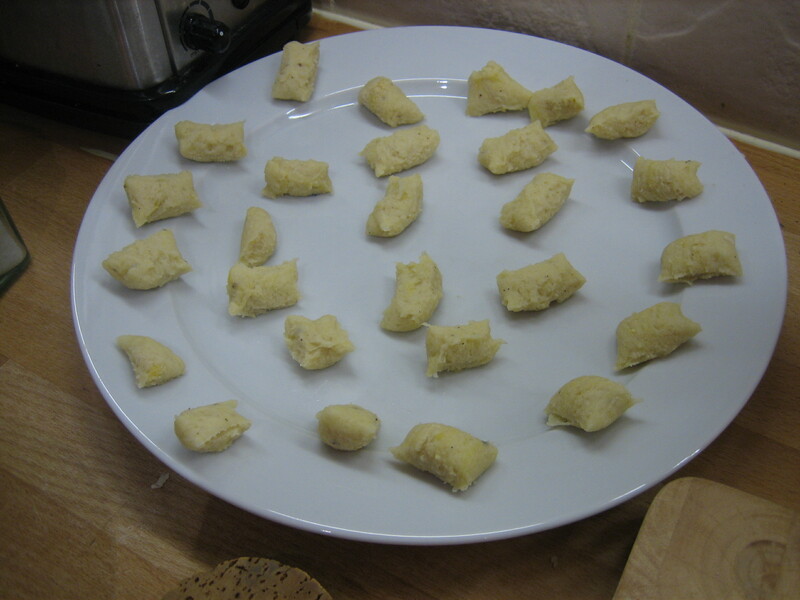 **** once you have made your gnocchi you can press it lightly with a fork to make it ridged, this is good as the gnocchi will hold onto sauce better. It is not essential, I didn’t do this as I was in a rush. 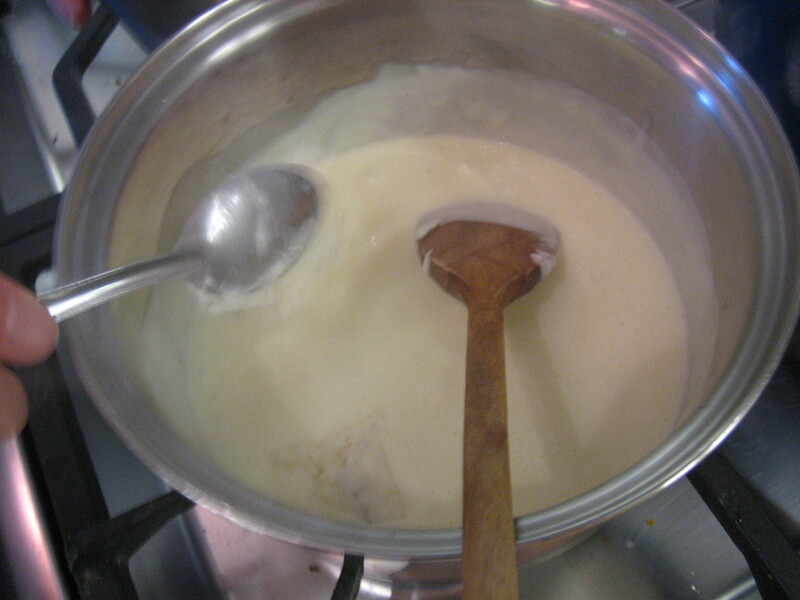 Bring a large pot of water to a rapid boil and add a large pinch of salt. 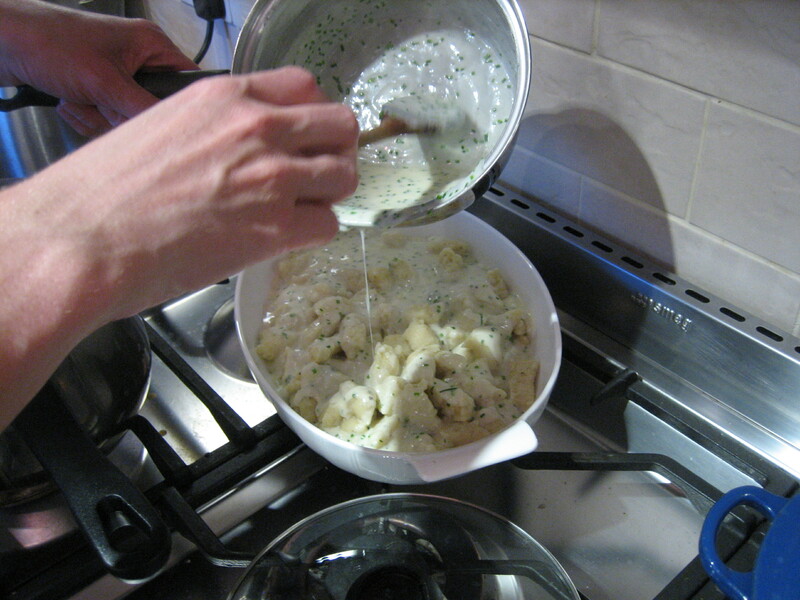 Take the Gnocchi and in pop the little dumplings into the water one by one (you will probably need to do this in about 4 batches). 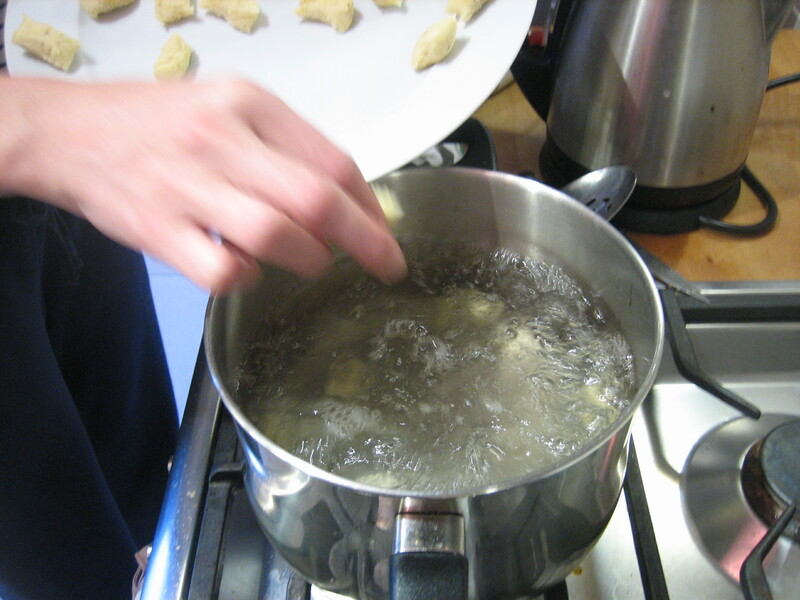 As soon as the dumpling pop to the surface they are cooked, remove them with a slotted spoon and pop them into the warmed dish. 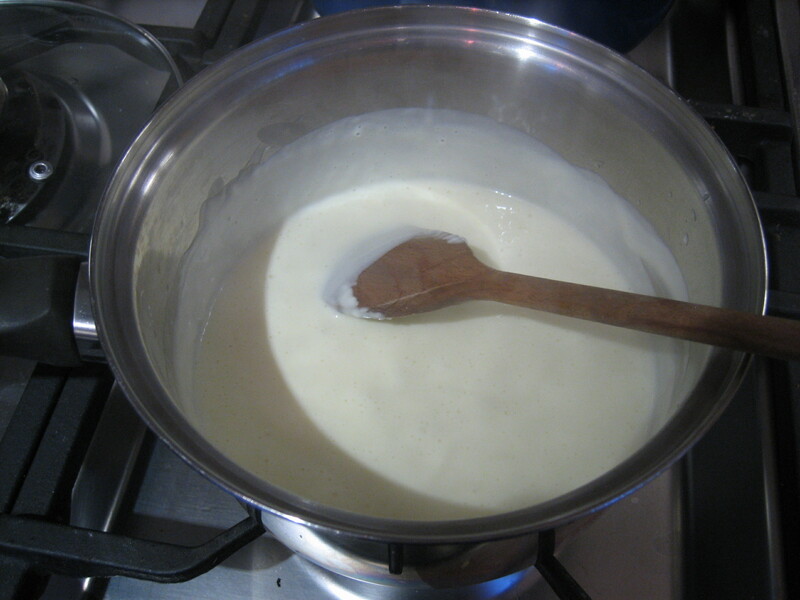 While this is all happening take a small pot, ideally a heavy based one, and add the tub of Mascarpone. Once it starts to bubble crumble the Gorgonzola through and stir. Leave on a low heat until Gorgonzola is thoroughly melted, add some freshly ground pepper and the finely chopped chives. Once you have cooked all your gnocchi pour the sauce over the top and pop under the grill until it bubbles and is golden brown. 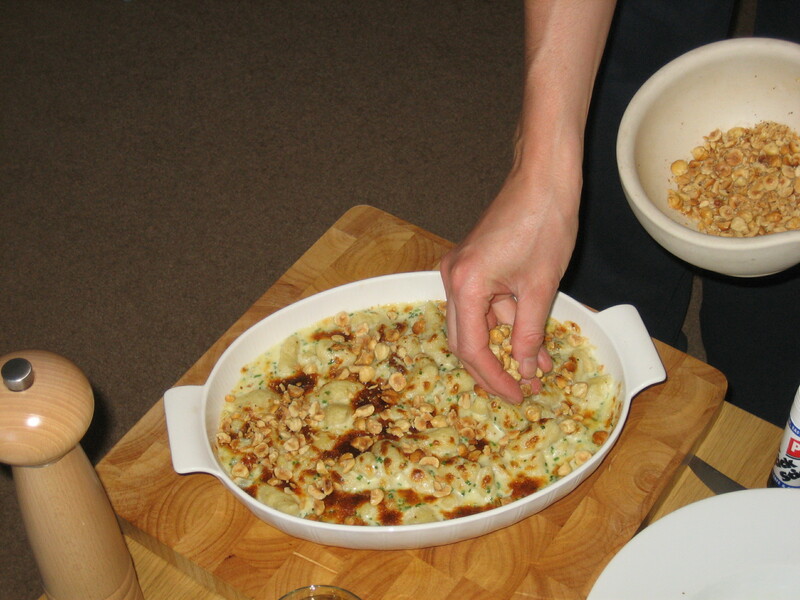 Serve with chopped roasted hazelnuts sprinkled on top, a bitter leaf salad and some crusty bread.